Sign up with XebraTax Accounting in March or April and receive 3 months free subscription including your Xero accounting software subscription. Limited ONLY to first 15 businesses. ACT FAST! March Madness Special Discount…Become A XebraTax Client & Get 3 Months Free Subscription Including Your Xero Subscription. Great Service & A Great Deal! Start The New Financial Year With Three Months Free Subscription Including Your Xero Subscription! The 1st of April is the new financial year for all New Zealand Businesses and this is a great time to change your Accounting Services. 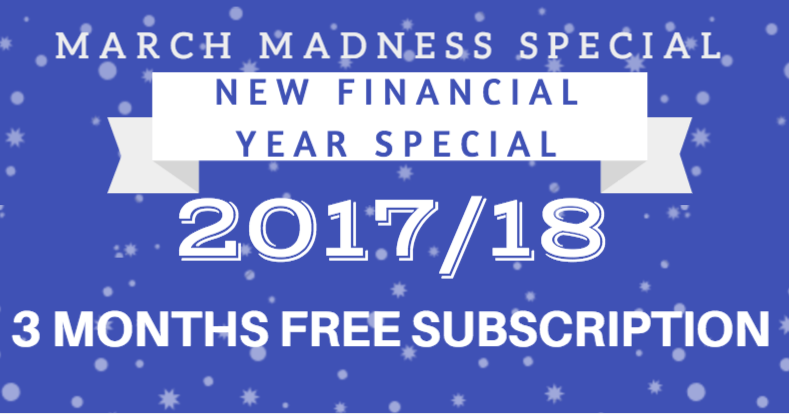 For the month of March and extending into April 2017 we have a very Special Offer – “Subscribe to XebraTax as your new Accounting service in March or April and get three months subscription free including your Xero subscription. So you won’t need to pay any subscription fees in April, May or June! This will save you hundreds of dollars! At XebraTax we have developed the ‘best value accounting service on the market’! We know, because we have tested it and compared it to the rest of the market. Prices For Sole Traders and Companies. You may be wondering what our XebraTax monthly subscription costs are? The answer for that is, “that it depends on a few factors”. Some of the factors that determine your subscription fee is whether you are a Sole Trader or a Company, are you GST registered or not, do you do Invoicing online or not, as well as a few other factors. So to give you a set price on our webpage now would probably be inaccurate until we understand your situation, which is why we ask you to complete the questionnaire to the right of this page and we can then give you an accurate quote. Note: This offer is only valid in March & April 2017.